The business and tax environments are changing rapidly, significantly affecting how corporate tax functions leverage technology, engage with their information technology (IT) departments, and execute technology projects. To adapt to challenging times, tax needs to reevaluate how it exploits data and technology and reconsider the skill sets needed to transform the current tax function. Global tax administrations and other stakeholders demand tax transparency, resulting in additional reporting requirements, increased controversy, and risk to reputations. In addition, tax is expected to step up to contribute to the organization’s broader objectives. To meet increasing demands with tighter deadlines, tax is joining other enterprise functions to deploy technology and data analytics solutions that will enable quicker access to accurate data. the vast majority of tax functions will rely on professional data analysis tools to assist decision-making in areas such as risk detection, identifying opportunities, projections and scenario planning, and overall business support. In light of the growing interest in leveraging technology for tax, tax functions must now be able to execute larger and more complex projects than ever before. In addition, these projects require the attention and acceptance of key internal and external stakeholders. After all, accounting, treasury, operations, and other functions are competing for the same funding. Furthermore, when technology projects are approved, it is critical to engage the right players, with the appropriate skill sets, early in the process. Tax needs to provide a clear vision, governance, and strategy for project execution to avoid common pitfalls that can jeopardize results and benefits. Here are some ways to make your tax technology project shine. For a tax technology solution to be approved and given high priority, tax needs to explain clearly to C-suite stakeholders why the technology is worth the investment. The cost/benefit analysis must be thoughtful and carefully constructed and consider various solutions. Although financial costs and benefits—such as efficiencies gained and costs saved by leveraging cross-functional or enterprise solutions—may be easier to quantify, nonfinancial costs and benefits—including the impact on people, compliance, and statutory requirements—are also critical to the overall assessment. decreasing the risk of penalties. higher levels of employee engagement. In performing the cost/benefit analysis and scoping the project, tax should realistically estimate what is needed to complete the project. For instance, how many hours really are needed from all the different areas, with what timelines? Are tax staff available to perform required tasks, especially during busy season? Are additional resources needed? Without realistic estimates, a project can be destined for failure before it begins. These expectations also need to be set with IT. alignment with the enterprise’s overall technology roadmap and relevant projects. Historically, tax could implement tax software with little help from other departments. 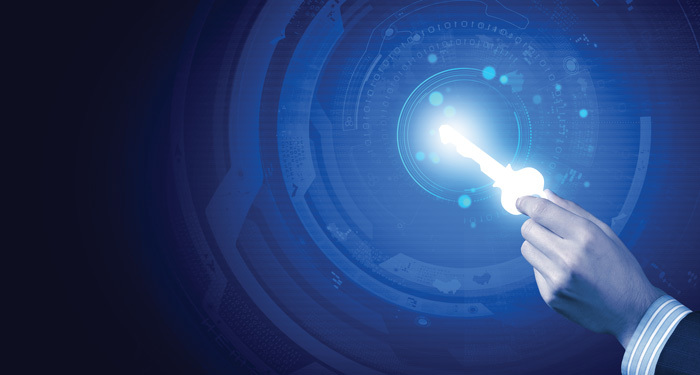 However, the advent of new cloud strategies, data security, and integration with enterprise solutions have resulted in more complex solutions and implementations. Tax should not go it alone but rather should seek buy-in from other functions, including finance, IT, treasury, risk management, and others. The more support tax receives from within the enterprise, the more likely the project will be approved and the less likely that tax alone will need to fund and support the solution. Tax should engage other functions in the business case process, highlighting direct or indirect benefits that other functions will realize. Tax also should engage IT early on to determine how the tax project relates to other systems and architecture within the enterprise and then partner with those functions to leverage existing technologies and processes such as formats and templates. Alignment with other enterprise functions could reduce costs related to license fees, hardware, and IT support. The following steps are key to top-notch implementation. One factor crucial to the success of implementing a tax technology project may be the least considered or least available—the people involved. Typically, tax would look to IT (in-house or consultants) to understand the requirements and build a working solution. The role that the tax team plays in this process too often may be minimized, because tax professionals are burdened with their tax duties and may consider the IT tech team the experts whose job is to deliver a sound technical solution. In cases where larger tax departments can employ a dedicated tax technology team, there still is a need to engage the tax professionals who have functional knowledge and who ultimately will utilize the technology. Increasingly, as technology disrupts how businesses operate, tax professionals need to adopt a mindset to embrace and develop new skill sets to execute technology projects. These projects should no longer be considered isolated special projects, but rather the way of the future. 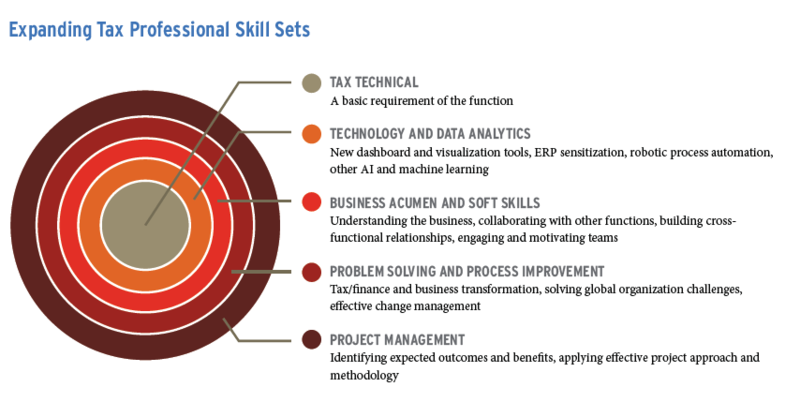 To contribute to successful technology projects and operate and manage new technologies post-deployment, tax professionals will need to develop skills beyond core tax technology. Technical skills—including data management, visualization, and data analytics—have become essential for all aspects of tax. In addition, tax will need to interact with IT in conveying requirements for the solution, collaborate with other functions regarding impacts on the business, and monitor timing and quality of deliverables. Tax professionals will need to demonstrate business acumen, soft skills, problem-solving, process improvement, and project management skills throughout the project’s life cycle. tax functions will employ dedicated tax, IT, data, and project management specialists who will develop, champion, and execute the tax technology and transformation strategies. Objective. Establishes the purpose and intent of the project, including a description of the technologies to be deployed. Approach. Describes the methodology to be applied in executing the project. Roadmap and time frame for completion. Establishes phased timing, including key milestones and dependencies, for in-scope requirements (to accommodate budget and other infrastructure and business needs). A phased approach, with simpler activities early in the project, also helps to establish a solid foundation with visible, useful successes on which to build. The sponsors and key stakeholders. Lists the sponsors and key stakeholders of the project along with their role within the organization. These individuals take ultimate responsibility for the project’s success and business outcomes and should include stakeholders from other functional areas of the enterprise. documenting an agreed-upon approach to issue escalation, resolution, and scope management. Implementing work plan methodology. Facilitating a well-run project requires adopting an organized approach and methodology that guides the project team through the various stages of the project. IT, if engaged, would likely use its own approach; however, it is important for tax to understand how the methodology is applied. The life cycle of a project runs from planning to post-implementation review, with built-in milestones for key stakeholders to review and approve at each stage. 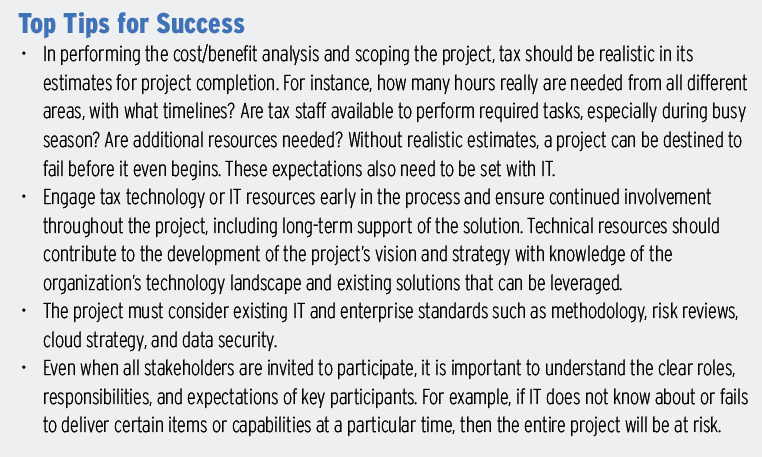 The graphic below depicts an example of project methodology that can be applied for a tax technology solution. Project managers typically track the status of a project in a work plan that includes detailed tasks and expected deliverables for each phase of the project. The work plan should indicate who is responsible for performing tasks with a start and end date for each activity. Such rigor in planning and tracking all required steps is important so nothing falls through the cracks and each phase is completed according to schedule and in line with the budget. Plan/engage. Engage stakeholders, project team, and determine governance. Strategize and assess. Develop vision and scope, assess current state, and determine functional and system requirements for future state. Design. Develop solutions for future state based on requirements. Construct. Build and test solutions or changes to tax technology. Implement. Deploy tax technology solutions into production; communicate with and train members of tax and other teams. Operate and review. Monitor for realization of expected benefits, future fixes, and enhancements. Other approaches to project execution include agile methodology or partnering with a system integrator. Since implementing tax technology requires numerous moving parts and involves many people, much can go wrong. Let’s examine common challenges and ways to avoid them. Vague ideas about the solution are insufficient. Tax should ensure that deliverables are clearly defined and that a roadmap is developed for phased delivery. Without clear objectives and a timeline roadmap, the project could lose focus as time and funds are consumed by reworking. Leadership and active engagement from tax, IT, and finance are key to implementing tax technology successfully. Tax needs to embrace the project, not only securing funding but also committing time and qualified resources and communicating the project’s benefits to IT, finance, other functions of the enterprise, and even other members of the tax department. Additionally, key leaders of the steering committee need to be involved regularly to remove barriers to success and solve critical issues. Project meetings need to be about more than making a status report, although regular updates are important. Comprehensive and accurate requirements are needed so the design of the solution meets tax’s needs. However, proposed requirements that are out of scope should be rejected unless they are so beneficial that the scope should be expanded to include them. Widening the scope may require changes to the budget, timeline, and resources. It is easy to underestimate the effort that project management entails. Keeping track of detailed project activities and deliverables, managing risks, and reporting to stakeholders are time-consuming and require dedicated resources. IT may perform the role in some cases; however, the project must ensure that the PMO is organized and attentive to detail and leverages the appropriate project management tools and templates to facilitate the process. A simple Excel spreadsheet list of tasks is not an effective tool for managing a tax technology project. Tax needs to be comfortable leveraging more sophisticated methods, including project management software. In light of the growing interest in leveraging technology for tax, tax functions must now be able to execute larger and more complex projects than ever before. A major reason that technology solutions remain unused after deployment is lack of awareness. Information needs to be shared appropriately with users and other key stakeholders throughout the project’s life cycle. After requirements are determined and the solution designed and implemented, tax should gather feedback from user testing. Communications on timing of deployment should be distributed to all individuals in tax, finance, IT, and other affected stakeholders. The human resources department should be engaged to facilitate training and encourage widespread acceptance and adoption of the solution. A successful tax technology project requires careful planning and commitment to daily project management and risk mitigation to minimize potentially significant financial and operational risks. The cost of procuring and configuring technology can be substantial, so the risk associated with wasted time and money is very real. Furthermore, if the requirements provided for the solution are incomplete or inaccurate, the resulting technology could produce unreliable financial or tax data. Diligently applying a standard, tested methodology keeps the project on course, ultimately allowing the enterprise to realize the projected benefits. In fact, project methodology can apply to any process improvement initiative, because it is simply an organized way to ensure that all important factors in developing a solution are considered and that the work engages the right team of stakeholders and subject matter experts. Perhaps even more important than the methodology are the people. It takes tax vision, leadership, and management to develop a compelling business case, secure a team comprising cross-functional stakeholders, and successfully deliver according to plan. These are the new expectations for the tax professional of the future. Andy Ruggles is the national leader of PwC’s Tax Reporting & Strategy (TRS) practice, with a focus on leading clients and teams in the use of process and technology. Todd Bixby is a partner within PwC’s TRS practice, with an emphasis on tax technology and data analytics.